Astrology is usually very simple and straightforward. That doesn’t necessarily make it easy to comprehend because our own heads are often stuffed full of irrelevant rubbish. But often we come across a chart so simple that a child of 5 could explain it. Adeline Blondineau is a French TV actress but is probably best known for having been married twice to the French Elvis, Johnny Hallyday, who himself was married 5 times. Their first marriage lasted two years , the second one barely a year. She has since had relationships with Argentine model Sergio Tamporelli and Lauren Hubert having a child with each. When doing chart interpretations the most important thing is to give proper weight to the planets. Focus on the Sun, Moon and Ascendant and then look at any major aspect patterns. If all those significators are basically saying the same thing, the astrologer can put her feet up as its an easy day at the office. Leos have a strong sense of the dramatic and love to be the centre of their own personal stage. This is not the same as saying that they’ll all be actors but when an actor comes along with the Moon rising in Leo it certainly simplifies things. The Moon rules a person’s needs and the Ascendant rules they image they want to portray. The Sun’s house position in a chart shows the area of life that the person will focus most of their energy on. The 7th house rules marriage and relationships so someone with the Sun in the 7th may easily be best known for their marriage. The Sun and Moon are opposite each other and this focuses by T Square onto Saturn in the 10th house of career. So the 5 year old version is as follows – There was young girl who really wanted to be a famous actress ( Moon rising in Leo ) but she couldn’t get any parts ( Moon square to Saturn ). She married ( Sun in the 7th ) an old man ( Sun square Saturn ) who was a famous pop star ( Saturn in the 10th ). She then thought she was in love with someone else ( Sun opposite Moon ) and left the old man but she still couldn’t get an acting job so she married him again. This time she did get a TV series, so she left the old man and married a handsome model that she met on the TV set. The T Square makes it all so simple but the pattern was reinforced by other factors. Adeline Blondieau had Venus ( love life ) in square to Uranus and Pluto ( big changes ). She also had a Mars / Jupiter / Neptune conjunction in Sagittarius in the 5th house – yes we get the idea she liked acting and affairs. Of course Capricorn Research does recognise that it takes two to tango and that a 47 year old pop star may also have something to gain from an attractive 19 year old wife. An apex Saturn would also guarantee a fair amount of hurt and suffering for both parties but its not hard to see that the marriage wouldn’t work so well in the long term. It’s also easy to give the impression that both approached things with a calculated agenda, but of course this is not the case. Blondieau’s chart was so clear that it gave her no other options in life. Of course the one planet that doesn’t allow other choices is Pluto and the aspect that fences people in like no other is the Grand Cross. 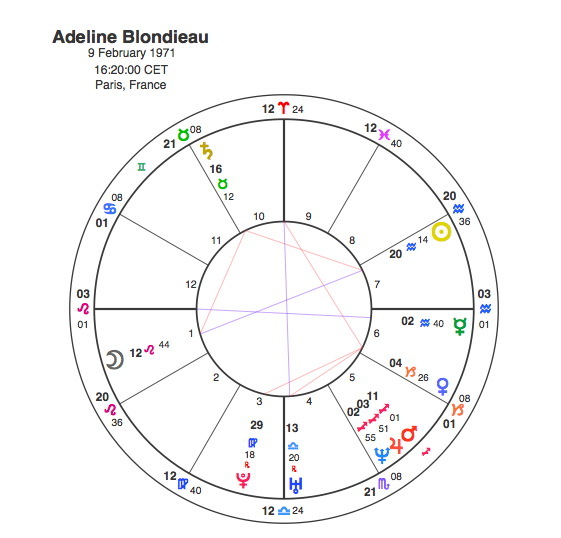 Adeline Blondieau married Johnny Hallyday in 1990 as Pluto formed a Grand Cross opposite her Saturn and square her Sun and Moon. This aspect lasted until 1992 as long as their first marriage. The 5 year old might add – The young girl wanted so much to get married ( Sun in the 7th ) and become an actress ( Moon and Ascendant Leo ) that a genie ( transiting Pluto ) came along and granted her wish. But he was an evil genie ( Pluto opposite Saturn ) and they didn’t live happily ever after.